So, we know that having a niche is important. And now we know how to identify a good one. So, this is all great in theory – but how about in practice? What about in your particular situation. This is the hardest part. Identifying your niche(s). After all, you could choose any one of hundreds of possibilities. How do you choose? The following ten questions are based on the assumption that you don’t already have a strong implicit niche for what you do – that there’s the possibility to choose a more narrow niche. They’re also based on the idea that you want to choose a niche that is a natural fit for you – a niche that’s an extension of you somehow. You want the niche to be fun. In truth – it doesn’t need to be for the success of your business – but it likely does for your own fulfillment. So, these questions are often about you – getting to know yourself. First of all, if you feel uptight about making the choice – relax. You’re not crazy. It’s a tricky question. And you’re not alone. A lot of people feel this way. And also relax because – you don’t have to figure this out over night. It’s okay – and often important – to take your time. When I teach workshops – this is where people get stuck. All the theory I covered before is fine. It’s logical. It makes sense. They love it. And then I invite them to pick a niche to focus on for the weekend – and they freeze up or freak out. I’d suggest that there’s at least ten primary ways that I’ve seen people use to pick a niche that fits the eight key criteria. Now, not all of these will make sense or be a fit for your situation – but I invite you to sit with each question for three minutes – take 30 minutes with this – and see what comes up. You might just be surprised. Come up with your answers and then let yourself steep in them. Write the answers down and then schedule to revisit them in a month. Actually schedule it. Here’s the ten themes and questions. 1. personal tragedy and defining moments: if you’ve been through breast cancer and you’re a holistic practitioner, you might feel passionate about helping other women going through that process. If you’ve been through a painful divorce and you’re a life coach – you might feel inspired about coaching women who are going through one themselves. Some people find that helping others through painful events that they’ve gone through is actually very healing for them. Personal tragedies can often be a source of immense passion and purpose. The defining moment might also have been a very positive thing. Maybe you climbed Mt. Everest. THE QUESTION: What have been the five most defining moments or personal tragedies of your life? 2. community you’re a part of or want to serve: if you’re a part of the reiki community and you’re a massage therapist, why not serve the community you’re already a part of? Maybe you love the green business community and want to focus your accounting skills there. The point is that sometimes your niche is staring you right in the face. THE QUESTION: What groups, networks or subcultures are you already a part of? 3. time of life (e.g. retirement): most people will go through certain events – transitioning from one career to another, becoming a parent, retiring, divorcing etc. You might decide that your niche is based around one of these transitions. You might be a “retirement coach”. You might have a boutique furniture store and do some promotions for new parents – or parents whose kids are “finally” leaving home. Remember: a niche can be for your whole business or just a simple promotion. THE QUESTION: What life transitions do you think are the most natural fit for what you do? 4. profession & industry: Perhaps your niche is based on working with a particular industry. Maybe you’ve decided to work specifically with Ice Cream shops or maybe you’re going to sell your products and services to doctors and hospitals. You might decide that you’re going to do a fitness package for accountants. Sounds weird – but it can work. THE QUESTION: What professions or industries are you a part of or think might be the most natural fit for what you have to offer? 5. hobby/lifestyle: Maybe you’re a realtor who focuses on dog lovers. I know one life coach who is a tea geek – he has a socially unacceptable knowledge of tea. But he’s building a whole online business with himself as a tea sommelier. THE QUESTION: What hobbies, interest or bizarre fascinations do you have? 6. specific unsolved problem: maybe your niche is based around a particular, very specific problem that people face. It could be a specific issue people have with their kidneys, it could be ‘how do i get my videos online?’, it could be ‘how do i get my website to sell more products?’ The key is to look at a problem that a group of people are frustrated with. THE QUESTION: Is there a very particular problem that your product or service solves particularly well? 7. your strengths: all of us are strong in some area. We have certain qualities that make us who we are. Maybe our strength is that we’re really sensitive. Maybe it’s that we’re really good at diffusing conflict. Maybe we’re naturally entertaining or a great problem solver. I noticed years ago that I was really good at leading workshops and was entertaining – and that I was good at coaching people. 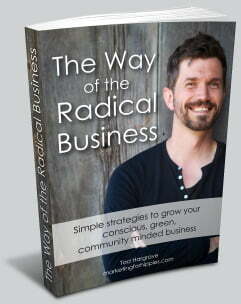 So, I asked myself, “What kind of work could allow me to do that?” That was a big part of Radical Business starting. THE QUESTION: what are you really, really good at? 8. your passions: I think that the best niches are built around some passion that you have. For me, I’m passionate about alternatives – but even more so I’m passionate about helping friends of mine get over their marketing hurdles and frustrations. I really love doing that. I’m passionate about leading workshops. I’m passionate about tinkering and improving the workshops. THE QUESTION: if you could do anything with your life what would it be? what topics, activities etc. are you most passionate about? 9. the underserved: In almost any marketplace – there’s some folks who are getting ignored who would immensely benefit from your product and service. When I used to do workshops for Student Councils in High Schools across Alberta I found that the rural schools were massively underserved – and yet were most willing to spend the most money. THE QUESTION: Who aren’t your competitors serving? Who could benefit immensely from your product or service that isn’t being actively courted? 10. the one’s you already got: If you’ve been in business for a few years or more – you might notice that you seem to attract and retain a certain kind of person. It can be interesting to look at what niche or community you seem to be attracting most easily. It’s interesting to notice who you enjoy most from the people you’re attracting. THE QUESTION: Who do you seem to be already, naturally and effortlessly attracting? Who seems to be showing up?